As conquistadors, one of the goals of the Spaniards back in the 1500's was to impose their culture on ours; it was as if most of our pre-colonial culture has been swept under the carpet. In our history books I remember that we would memorize the tribes and where they were located, but we just slightly brushed on that topic. It would always be the Spanish Colonization, the American Occupation, World War II, etc. that would take most of our time, but in fact the longest "occupation" ever experienced in the Philippines were our own indigenous people. I have to admit I do not know much about the tribe culture here in the Philippines. The most tribal I can get is that I have a barely sufficient amount of knowledge on Philippine Mythology and that tapis is for women and bahag is for men; but while I was scrolling through Tumblr I saw this video called "The Last Tribal Tattoo Artist". It was enlightening. I felt like I unearthed something that has long been there but has been tucked away in a sea of clutter. Let me share with you this feeling, dear reader. Below I introduce to you the culture of the pintados. Maria Whang-Od going at her craft. "Visayan Pintados" from the famous Boxer Codex. The word pintados is actually Spanish for "painted people". 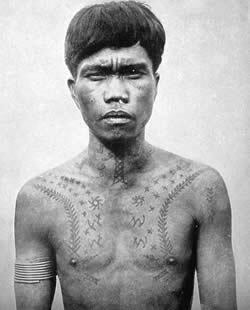 When the conquistadors landed in the Visayan region in the early 1500's, they saw that most of the tribe members were tattooed from head to toe. Thus, they were called pintados. There are also famous pintados in the Cordillera region like the Kalinga, Ifugao and Bontoc. The functions of these tattoos are not limited for aesthetic reasons. The tribes people believed that the tattoos possessed spiritual and magical powers that give strength and protection to the wearer. Tattoos on the body, even on the owner's own face, are used to intimidate opponents during combat. After a successful hunting, the headhunters, as in people who hunt for people's heads, would come and get their tattoos as a symbol or reward for their triumph. It also marked their social standing in the tribe. For women, they would usually get their tattoos by puberty. Tattoos for women signified acceptance into society and the start of adulthood, which completely goes against what society believes in today. Some tattoos are even believed to increase their chances in fertility. From the video, the last Kalinga tattoo artist, named Maria Whang-Od, uses dried grass first to trace the tattoo on the body. Usually tattoo artists would use a small sharp object, bone, wood, or a thorn that is repeatedly tapped into the skin to apply the ink. Below are some examples of tattoo designs on the Cordillera people. An example of a Kalinga woman's tattoos. "Ganawang, the mythical eagle, is both omen bird and spiritual messenger to the gods. Other tattoos on the biceps, arms, and torso map the environment (e.g., plant life, water, and insects), while others are associated with fertility. Together they comprise nature from which all tattoos take their meaning. " 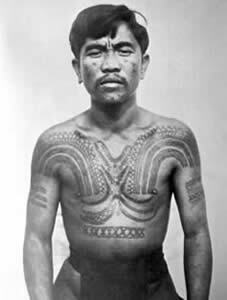 A Bontoc Igorot wears a chaklag or chest tattoo that starts at his chest and ends to his upper arms. The chaklag tattoo symbolizes a warrior's success in his kill. 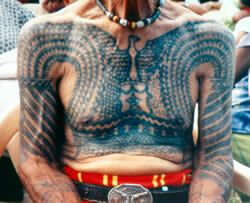 As seen above, these tattoos are not just alibata drawn on skin. These tattoos are intricate, meaningful, and significant. By tattooing animals and the environment on their bodies, these connects the people with their religion, which is animism or believing that there are spirits in nature. They establish social class in the most creative ways like painting it directly on your face. The battle among two warriors do not begin by the clashing of weapons but by showing off their fearsome tattoos. Across the Internet, there are videos of today's youth seeking out the master tattoo artist and last traditional Kalinga tattoo artist Maria Whang-Od. One of the people who went out of their way to find her was Heather Fassio and her group of multi-national friends. They created The Pintados Project to seek out our forgotten culture. Is it shameful that it isn't the native Filipinos that have taken interest in Philippine pre-colonial culture? I don't think so. I think that as long as that there are people who are willing to open the rest of this country's eyes on how rich our culture used to be, then there is nothing wrong with that. The fact that there are Filipinos who did not grow up in their own soil and are dedicated into tracing their roots just proves how there is still so much hope in our people. That's why I call to you readers to take action. Take interest. People say that our country is a melting pot of different culture but let us not forget our own in the midst of things. Let us not forget our identity. Better yet, let us not let our identity go to the grave. Disclaimer: I am not advocating nor imposing anything on anyone. A lot of teenagers are thinking of getting a tattoo in the future. Some may have already fulfilled their dream, but others have failed or are still struggling to do so because of many reasons (i.e. the hassle, the pain, the expense, or most commonly the pending permission of parents). Although, there is a way you can permanently ink your skin without having to go to an actual tattoo parlour and/or without your parents knowing. It’s called Stick And Poke. The gist of stick and poke tattoos is basically poking [or piercing] your skin with a needle and some tattoo ink. It sounds quite simple but you definitely need some practice to perfect this art form. These kinds of tattoos are also called jailhouse tattoos since these methods are what prisoners have been using for ages, but stick and poke is currently being modernised and utilised by a vast number of youths in their homes as well as among their friends.